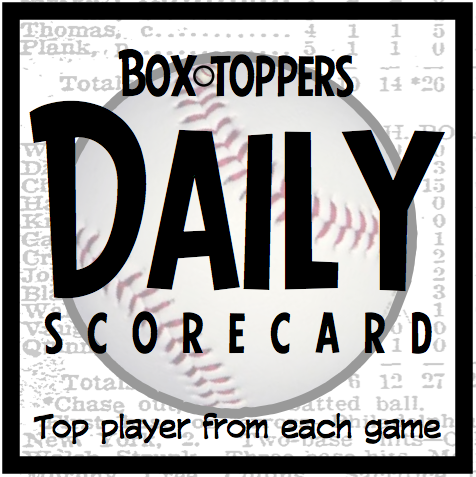 Nationals pitcher Gio Gonzalez is Thursday's Player of the Day. Gonzalez pitched seven scoreless innings and struck out eight in the 9-0 win over the Marlins. Gonzalez rises to 26th in Box-Toppers player rankings. He earns 2.0 Box-Toppers points for being Player of the Day, giving him 10.7 for the season. Angels pitcher Jason Vargas is American League Player of the Day. Vargas pitched seven shutout innings, giving up only two hits and striking out seven in the 2-0 win over the Rays. Gonzalez and Vargas had identical Box-Toppers game scores of 9.0, but Gonzalez earned overall Player of the Day honors because he had one more strikeout than Vargas (eight vs. seven). Prince Fielder is AL Batter of the Day. Fielder homered, scored three runs and went 3-for-4 in the 7-6 win over the Athletics. There is no National League Batter of the Day Thursday because no NL batters earned Player of the Game honors. Notable: Orioles pitcher Chris Tillman rises to 24th in Box-Toppers player rankings for the season after earning Player of the Game honors Thursday. Tillman (7IP 8K W in 3-2 win vs. Red Sox) earns 1.0 Box-Toppers point, giving him 11.7 for the season. Gonzalez receives 2.0 Box-Toppers points for being Player of the Day. Vargas receives 1.7 for AL Player of the Day. Fielder receives 1.5 for being AL Batter of the Day.